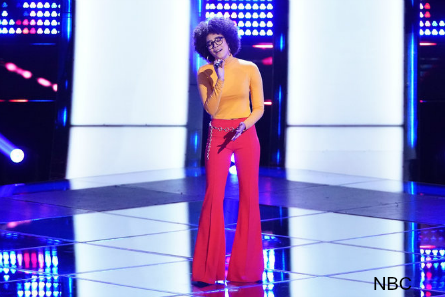 The third week of “The Voice” season 16 Blind Auditions, continued the coaches search for the best voices to build their teams. Newbie coach John Legend continued to be a threat, mostly to Adam and Blake. 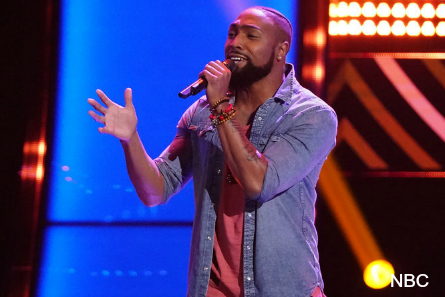 With the Blocks gone and the team nearing full, the coaches – Kelly Clarkson, Adam Levine, Blake Shelton, and John Legend were getting more critical of who to turn their chairs for. 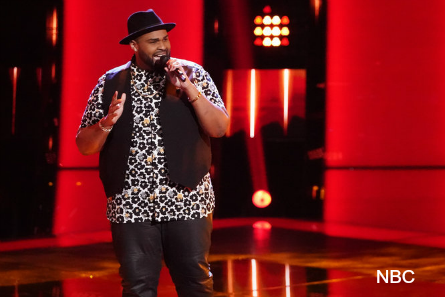 This week’s ‘Voice Bind Auditions showcased 14 contestants in one night, Monday. Slightly less compared to past weeks where viewers typically saw 16 contestants spread over two nights – Monday and Tuesday. Adam’s campaigning for John Legend to contestants had an opposite effect in some cases where they chose Blake instead. John called it “the kiss of death” and sought to get Adam back. “The Voice” production also continued to keep breaking the fourth wall more this season than in others by including footage of the coaches entrances onto the stage, a contestant’s pre-audition jitters in a behind-the-scenes style, showing the stage manager along with other side production clips. Beth is 46-years-old from Detroit, Michigan. She has Motown in her blood because of her dad who was part on Motwon’s “The Funk Brothers.” He played on Marvin Gaye’s ‘What’s Going On.” He passed in 2002, but Beth says he’s always around through the songs he played in. She toured with Anita Baker for five years. Beth sang an Aretha Franklin song for her ‘Voice Blind Auditin because her dad was Arehta Franklin’s first piano player. Coach – Kelly. John was heart-broken “She can only have 12,” Johns said referring to the number of artists on the Teams. He credited for Kelly’s 2 for 0 wins for Beth choosing her. Kelly said it’s exciting to be blessed to have a voice like Beth’s. She’s from South Africa, but lives in Orlando, Florida now. She sang on cruise ships singing three hours per day. Her husband, who she met working on the cruise, said Selkii lights-up a room when she performs. She sang “I Try” for her Blind Audition. Adam turned soon in, and Blake waited until the end. Adam pointed-out that his wife is from the same place that Selkii is from. He told her it’s a great song choice and loves her “vibe.” Kelly said she doesn’t sound like anyone on the show and has that going for her. Blake saiad he imagines over in South Africa, she’s Country because she has the hat and the guitar going one. BLake stated that he’s won the show “twice as many times” as Adam. Blake tried to sway her by telling her he’d like to open for her in South Africa one day. She said her husband chose for her – it was Blake. Coach – Blake. Blake said Selkii made his day and love that singer-song writer vibe that she has. Denton is 31-years-old from Chicago, and grew-up in a musical family and is currently teaching music to young adults at a youth church. He’s been dating his girlfriend Tiffany, who taught dance at the church, for three years. 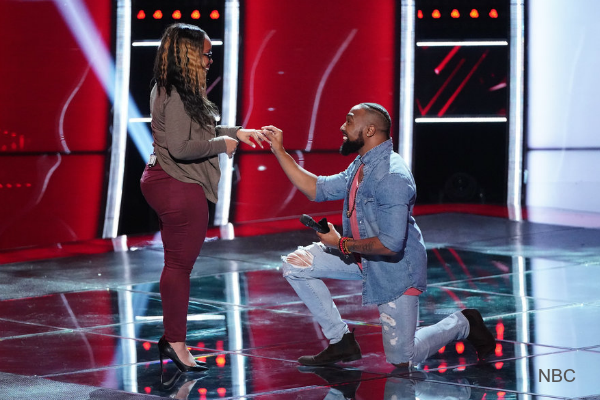 Denton said he wants to spend his life with Tiffany and brought a ring to his ‘Voice audition in his preperation to propose to her. Adam told him he has a great voice. John told Denton “welcome to Team Legend!” He said he took a song that could have been less exciting, but he made it his own. HE told him he was creative with the melody. Denton said now that John gave him a “yes” he called his girlfriend Tiffany out to see if she would give him a “yes” too. He proposed marriage. Tiffany said “yes” after he accidently butted heads with her! John said Denton has the “approach and the tone,” and he likes singers who are creative with the melody. John added that he wants to explore Deton’s voic to see if he can do something unexpected even though he’s an R&B singer. Ciera is 21-years old and calls herself fearless in how she looks in experimenting wtih different hair colors and styles. She was co-president of someone in her A cappella group and was voted “most likely to win The Voice.” Ciera sang “Tell Me You Love Me.” Both Adam and John turned at the same time. Adam called her “spectacular” and “everything you do screams what this show is about.” John said she got a little bit nervous when they turned, but when he heard the rasp at the edge of her high range, he could feel the “power, the emotion, the pain,” and can’t wait for her to tell her story on “The Voice.” Kelly compared her to Janice and said her voice is “solid.” Blake compared her to Bonnie Tyler and when her voice starts to “shred”, that her money. They all wish they had that naturally. 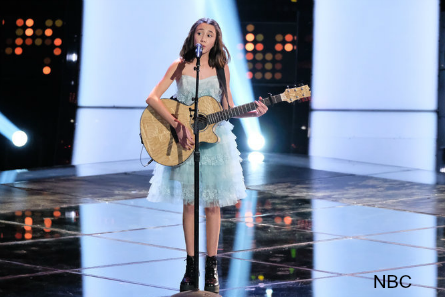 Adam said from her first note, she captures the entire room and thinks she could win. She chose Adam. Blake called it “easy.” John said they’re intimidating by him. Kelly was excited that she is from a neighboring city to Andrew’s. Kelly said she didn’t turn because she’s tired of getting laughed in her face by Country artists who choose Blake. John said everything was great and his high notes “electrified the room.” Blake said he loved the “rougher side of his voice. The growler side.” Kelly though Andrew sounded like Pryer from season 15. Mari, who is 20-yeas-old from Clarmont, Florida, works the front desk at a salon as well as doing makeup there. Mari sang “Boo’d Up.” John, Adam and Kelly all turned within seconds of each other. Coach – Adam. Adam said shehs “jazzy chops.” She said it felt like Adam wanted to do the best for her in the competiton, and move her forward. John said he will figure-out Adam’s weaknesses and exploit them. Crystal is 26-years old and has seven siblings. After their house burned-down, her family got split-up because her mother no longer had the means to take care of all of them. Crystal got sent to a children’s home until she was 18-years-old. Crystal said she felt “forgotten.” She felt less lost when she stepped-into her gift of music and singing. Crystal works as a server in Kansas City. Her sister Mitsu was at her ‘Voice audition to support her. She sang “Wicked Game” for her Blind Audition. Adam said it was his favorite song on the planet but it’s a difficult song to sing. John said the song required a level of dexterity and complexity, and she needs to repackage her audition. Blake gave the helpful advice of telling her, her chest voice was so good Find a song tht she can “get up there more” and “beat them up.” They all encouraged her to come back. John gave her hug when she was crying and told her to come back. Abby started singing in bars when she was ony 12-years-old and a self-proclaimed tomboy due to growing-up around all boys. Out of high school, Abby moved to Nashville. She sang “Here For the Party” with a lot of sass. Blake waited for the high note towards the end before pushing his button. Kelly followed. Kelly said she loves that “ballsey Country.” Kelly said she loved it and was into it. Blake said he turned around out of excitement, passion and desperation to have Abby on his team. Adam said if he thought he had a shot, he would’ve turned. Kelly stated that Abby is worth the rejection. Kelly stated that she’s sung with two of the greatest Country singers – Reba McEntire and Trisha Yearwood. Abby chose Kelly. Coach – Kelly. Kelly said she loves that Abby can sing a pure country soud but also can sing kind of rough. “Winning someone from Blake is better than winning the Lottery,” said Kelly. Abby said she chose Kelly “in the moment” and ‘it was a girl thing.” Adam called it the best day of his life! Mikaela is 14-years-old from Queens, New York. When not doing music, she does ariel silks. She started going to School of Rock at the age of seven. She does covers on YouTube. Said she’s been watching “The Voice” since she was six-years-old. Mikaela sang “Electric Love.” Kelly turned within the first few seconds of Mikaela’s audition. Followed by John. Blake was shocked that she was “just a baby.” Kelly said her tone “can not be taught” and that’s why she turned so quickly. She said it’s incredible to watch someone grow on the show. John said speical voices are hard to find and she has one. Adam, who didn’t take sides this time, told Mikaela to close her eyes and follow her heart when choosing a coach. She chose Kelly. John Turned. He said she has her own vocal stye and flipped the song in cool ways to give it more dynamic. He said the neo soul thing his where he comes from. Kayla is 18-years-old from Illinois. Kayla wears bold colors as her style. She has a 13-year-old sister, Jena who does her makeup. Kayla said growing-up she could sense that she was different. She said when she was 17-years-old, she came out of the closet by writing a song about liking a girl. She sang “Baby One More Time” by Britney Spears and put her own twist on it. Kelly told her she was so cool and loved her take on that song. “It sounded like rock-and-roll punk but with a sweetness, and aching” like Gwen Stefani. She said she held-back but would like her to explore more. JOhn said she was almost there, and liked that she had a new approach to that song. He told her to come back. Kayla and Crystal were selected by fifth ‘Voice coach Bebe Rexha to Battle each other in “The Voice” Comeback Stage. Their Battle can be seen on “The Voice” app, and on YouTube. Shawn, 33-years-old from Houston, is a middle school business education teacher by day, rock star by night. His birth name is Lionel Taylor. He taches keyboard. His students are excited that he’ll be on The Voice. Shawn made a video of him singing in class that went viral and re-posted by Snoop Dogg. He sings in a band. Shawn who hopes to inspire his students with his ‘Voice audition, sang “All My Life.” It started to look bleak for Shawn when he got more than half way done with his audition without any chair turns. Then, suddenly they all turned. Kelly said he has a solid voice, beautiful runs and range. John said his tone and range is great. He was impressed he managed a difficult arrangement that is a skill and had the best runs he’s ever heard at the end. “It was like you did a triple axel” and “you just nailed it.” John said Shawn deserves the 4-chair-turn. Adam said his chair is the most important out of the four chairs. Adam argued there’s no Shawn-Adam There’s a Sean-John. John said the end of the song showed that Shawn’s an artist and paints with his voice. Blake said why would Shawn go with a Coutnry artist? None of that matters. He said the “triple lindy” (but meant triple axel) . Blake continued, “we aren’t meant to be in the same genre. My job is to help you be the best you. Whatever you want to do.” Kelly connected with Shawn when she said she was also inspired to sing by one of her teachers. He picked John. Coach – John Legend. John said what’s crazy is he won another 4-chair-turn. John also stated that Shawn is going to dazzle the American audience with his charisma.